Gov. Tony Evers announced last week his budget proposal will include proposals to reform Wisconsin’s marijuana laws. Gov. Tony Evers says his budget proposal will include proposals to legalize medical marijuana, decriminalize possession of small amounts of marijuana for personal use, establish an expungement procedure for individuals who have completed their sentences and align Wisconsin’s laws on cannabidiol, or CBD oil, with federal standards. Gov. Tony Evers says his proposal would decriminalize possession, manufacturing or distribution of marijuana for amounts of 25 grams or less. Gov. Tony Evers’ proposal last week to legalize medical marijuana received a healthy dose of support from Chippewa Valley lawmakers. Regional legislators from both sides of the aisle expressed support for the Democratic governor’s plan to have Wisconsin join more than 30 other states in making it legal to use marijuana for medical purposes, such as pain management, but the idea of decriminalizing recreational use drew more skepticism. Evers announced Monday that his budget will include proposals to legalize medical marijuana, decriminalize possession of small amounts of marijuana for personal use, establish an expungement procedure for individuals who have completed their sentences and align Wisconsin’s laws on cannabidiol, or CBD oil, with federal standards. James said states that have legalized recreational use have seen an uptick in law enforcement contacts related to marijuana, including driving while under the influence of the drug. Worsening problems with opioids, methamphetamine and heroin already have led to an uptick in arrests for drugged driving in Wisconsin in recent years, James said, adding that he fears decriminalizing marijuana would only accelerate that disturbing trend. Another freshman legislator, Rep. Jodi Emerson, D-Eau Claire, said she is open to the governor’s marijuana proposals despite growing up in the “just say no” era of combating illegal drugs. She suggested the plan could help address several other problems for state residents. In addition, she said, approval of medical marijuana has the potential to fight the opioid epidemic and limit overdose deaths by offering residents an alternative method of pain management. The expungement piece of Evers’ proposal also could help address the state’s worker shortage by making it easier for people with drug-related red flags on their record to land jobs, Emerson said. Sen. Patty Schachtner, D-Somerset, was unequivocal in her support of medical marijuana. “If a consenting adult is experiencing pain, and if a doctor believes medical cannabis can alleviate that pain without a risk of abuse, then the choice to use medical cannabis should be regulated and made available to adult patients,” Schachtner said. But she acknowledged being torn about decriminalization. Bernier agrees with the argument that “we don’t want people who get caught smoking dope clogging up our jails and our whole court system” and said her Libertarian side tells her government doesn’t need to be monitoring everything people do in private. Still, she said, that changes when a person’s actions affect others, such as by driving under the influence, and she worries about the message decriminalization would send about drug usage to children and adults. “It’s sort of saying we’re good with people going around and getting doped up,” she said. Dr. Pravesh Sharma, a psychiatrist at Mayo Clinic Health System in Eau Claire, expressed concern about marijuana use by teens and young adults in a column he wrote in December. Sharma said marijuana is the most common illicit drug used by adolescents and young adults and that surveys show a declining share of that population believes the drug can cause harm. But he cautioned that research shows that marijuana use adversely affects brain development in young people and can cause problems in learning, memory, coordination, reaction time and judgment. It also can cause hallucinations, paranoia and a range of emotional problems, Sharma said. The U.S. Centers for Disease Control and Prevention acknowledge the marijuana plant has chemicals that may alleviate symptoms for some health problems but also warn consumers about other potential negative health consequences, including damage to the lungs and cardiovascular system from smoking it and potential harm to babies from use during pregnancy. For her part, Bernier said she has spoken with a number of Republican legislators who have indicated they are OK with medical marijuana as long as access is controlled by doctors and conceded that “maybe the governor is on to something” with his proposal to pursue a limited recreational use policy that stops short of full legalization. However, Republican Assembly Speaker Robin Vos of Rochester has said the whole proposal could go up in smoke because it includes provisions to legalize recreational use. With Republicans holding majorities in the state Senate and Assembly, Vos suggested Evers’ plan has little chance of passing. Reps. 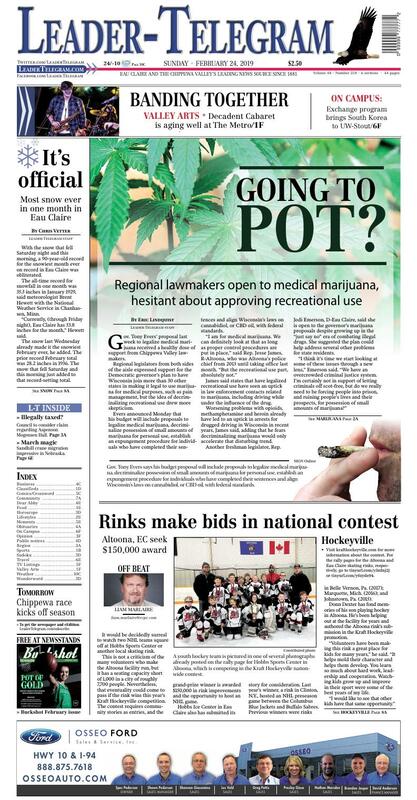 Rob Summerfield, R-Bloomer, and Warren Petryk, R-town of Pleasant Valley, said they want to hear more input from residents and experts about the potential impacts of the governor’s proposed marijuana law reforms before taking a stand. Several other area legislators didn’t respond to email inquiries about the new pot plan. While Evers’ plan would apply only to Wisconsin, one of 17 states that hasn’t legalized marijuana in some form, Democratic U.S. Rep. Ron Kind of La Crosse said during a visit to Eau Claire last week that he wasn’t disappointed to see the proposal. “I’ve always been in support of medical marijuana under the proper doctor supervision,” Kind said. The congressman recalled that he has had veterans tell him they go to Colorado, which approved adult use and retail sales of marijuana in 2012, to get pot to control their pain. “You don’t want them to have to do that,” he said. Still, Kind, a former prosecutor in La Crosse County, said he would want to see more research about the potential impact on youth marijuana use, driving and heavy machinery operation before endorsing legalization of recreational use. Loosening Wisconsin’s restrictions on marijuana attracted significant support in referenda across the state last fall. A news release from the governor’s office about the reforms pointed out that nearly 1 million voters in 16 counties and two cities in Wisconsin voted to approve nonbinding referenda asking if marijuana should be legal for medical or recreational use. All of the referenda passed. In Eau Claire County, 54 percent of voters supported recreational use of cannabis for adults and an additional 31 percent backed legalizing medical use. In Clark County, two-thirds of voters supported allowing regulated medical marijuana use. The governor’s proposal also would remove barriers, such as requiring yearly certification from a physician, to individuals obtaining CBD oil, which is derived from the cannabis plant but the CDC says doesn’t make users high. Demand is already strong for CBD products, which are available from several retailers in Eau Claire, so loosening restrictions would be welcomed in the industry, said Melissa Bellovary, co-owner of Your CBD Store Eau Claire, which is expected to open in early March at 1418 S. Hastings Way. The product can be applied in cream form or be ingested as a liquid or gummy drop. Evers indicated his plan to decriminalize possession, manufacturing and distribution of 25 grams or less of marijuana and establishing an expungement procedure for convictions related to the same quantities also would help to address racial disparities in incarceration rates for drug-related crimes. The governor is scheduled to release his proposed budget on Thursday. Members of the group Chamber Noise are shown during a performance last year at Decadent Cabaret at The Metro in Eau Claire. Event organizers take pride in the wide diversity of musical genres performed at the event. With the snow that fell Saturday night and this morning, a 90-year-old record for the snowiest month ever on record in Eau Claire was obliterated. The all-time record for snowfall in one month was 35.3 inches in January 1929, said meteorologist Brent Hewett with the National Weather Service in Chanhassen, Minn.
“Currently, (through Friday night), Eau Claire has 33.8 inches for the month,” Hewett said. The snow last Wednesday already made it the snowiest February ever, he added. The prior record February total was 28.2 inches in 1936. The snow that fell Saturday and this morning just added to that record-setting total. Records have been kept since 1893. Between Saturday and today, Hewett was estimating four to eight inches of snow, with possibly up to 10 inches. The possibility of some of that being rain, and freezing rain, will affect those totals. The snow should wrap up by 7 a.m. today, he said. Hewett reminded those who are exhausted from shoveling and plowing the white stuff that the snow season is far from over. A typical February brings seven to eight inches of snow for the entire month, but March is actually a snowier month in the Eau Claire area, with an average of about 10 inches. Unfortunately, Hewett doesn’t see any immediate change in the weather pattern. Hewett also pointed out that last April was the third-largest snowfall for that month in Eau Claire, as a large storm hammered the Chippewa Valley the weekend of April 13-15. April 2018 finished with 18.6 inches of snow. The average snowfall in April is 1.9 inches. It also was the coldest April ever on record. Entering Saturday morning, Eau Claire had already accumulated 57.2 inches of snow; the average number to date is 35 inches for this point in the season.